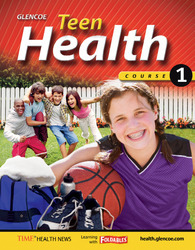 Teen Health stretches far beyond traditional health topics to cover the subjects your students really want to know about. It explains the importance of avoiding risky behaviors and provides step-by-step guidelines on how to do so. Student-friendly modules allow you to supplement the core curriculum with selected topics. The sixth grade book in Glencoe and Macmillan/McGraw-Hill's K-12 health program along with Glencoe Health (high school), Teen Health Courses 2 and 3 (grades 7-8), and Health & Wellness K-5 (elementary school). Cross-curricular integration throughout the program with reading and writing strategies in every lesson, as well as Connect To activities and Standardized Test Practice that provide links to math, science and social studies.